The LiDAR survey covered the central Forest of Dean, Gloucestershire, including extensive areas of woodland and the Aggregates Resource Area (Project Number 4798 MAIN). It was undertaken as Stage 3A of the Forest of Dean Archaeological Survey. It focused on areas of woodland and adjacent land covering the main hard rock Aggregates Resource Area of the Forest of Dean. Lidar survey was selected for these areas as the Aggregates Resource Area in the Forest of Dean is an area of active quarrying and the results of the lidar survey augmented archaeological investigation already undertaken as part of the Scowles and Associated Iron Industry Survey (English Heritage Project Number 3342) and enhanced knowledge of the archaeological resource in these areas, informing future conservation and management strategies. In addition, woodland in the Forest of Dean was identified by Stage 1 of the Forest of Dean Archaeological Survey (English Heritage project Number 2727) as an area where the known archaeological resource is underrepresented as a result of a lack of systematic field survey. Stage 2 of that survey demonstrated the value of lidar as a preliminary part of any future archaeological investigation within woodland. 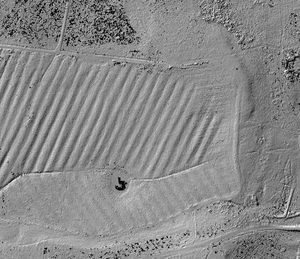 The results of the lidar survey form a discrete body of work of enormous significance to an understanding of the archaeology of the area. This project makes a significant contribution to knowledge of the archaeology and history of the Forest of Dean through the use of a new survey technique which will inform future conservation and management of the archaeological resource both within woodland and the Aggregates Resource Area.